As a teenager, Helen "Nellie" Herron visited the White House, and from that day onward her dream was to marry an American President. It was not a completely far-fetched goal -- she was visiting as a guest of the President, Rutherford B. Hayes, a friend and former legal partner of her father. And on her mother's side of the family, her grandfather, Ela Collins, and an uncle, William Collins, had both been U.S. Congressmen. She met William Howard Taft at a sledding party a few years later. He was a freshly-graduated lawyer when they began dating, but his father, Alphonso Taft, had been U.S. Attorney General under President Ulysses S. Grant. They dated for several years, and several times she rejected his proposals of marriage, but he persisted and she relented. They were married in 1886, honeymooned in Europe, and the next year he was appointed to the Superior Court of Ohio. She served several years on the Board of Trustees of the Cincinnati Symphony Orchestra, and as the organization's president from 1893-1900 she handled contract negotiations, fundraising, and ticket sales. The Tafts lived in Washington DC after he was appointed U.S. Solicitor General, then returned to Cincinnati when he was named by President Benjamin Harrison to the U.S. Circuit Court. She was First Lady of the Philippines for several years, while her husband ruled the islands, then an American colony, newly-won in the Spanish-American War. 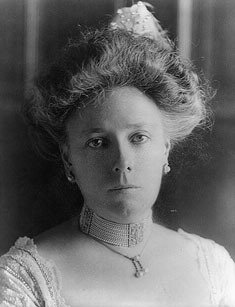 In 1904 they returned to Washington when her husband was appointed Secretary of War under President Theodore Roosevelt. She was invited to socialize with the other cabinet members' wives, but she found such events dull. Instead she worked quietly amongst White House aides and appointees to improve her husband's political stature, even demanding two private meetings with President Roosevelt to ascertain whether Roosevelt would run for re-election and, if he did not, whether he would support her husband. Finally, Roosevelt offered Taft his choice -- he could have a seat on the Supreme Court, or he could run for President, with Roosevelt's support. Taft wanted the Supreme Court position, but his wife nagged him into running for the Presidency instead. She maneuvered behind the scenes at the 1908 Republican Convention to an extent no woman ever had before, to be prepared with counter-tactics in case a groundswell of support emerged for re-nominating Roosevelt instead of her husband. After Taft secured the nomination, she peppered him with political advice as he campaigned, and when he won election to the White House it was, literally, her dream come true. At his inauguration she became the first incoming First Lady to ride with the President in his inaugural parade down Pennsylvania Avenue. Two months after she became First Lady, Nellie Taft suffered a severe stroke, leaving the left side of her body paralyzed. With tireless therapy and rehabilitation, within a year she was able to regain her ability to walk, albeit in a shuffling gait, and she could speak, though it remained somewhat difficult for strangers to understand her. During her recovery, most Presidential social events were hosted by her sisters Jennie Anderson, Eleanor More, and Maria Herron, and by her daughter, also named Helen Taft. As First Lady, she is probably most remembered for the planting of Japanese cherry trees along Independence Avenue, and overseeing the construction of West Potomac Park. She replaced the White House ushers, who had always been white men, with black men -- a move which was seen at the time as a daring step toward racial equality. She had the building's master bathtub replaced with an extra large tub, to accommodate her six-foot-four, 350-pound husband. She was also active with the National Civic Federation, a group of industrial and labor concerns that sought better working conditions for ordinary Americans. In a time when women could not vote, she described herself as a "qualified" suffragist, meaning that she supported the right to vote for women, but only for those women who could demonstrate a reasonable knowledge of political issues -- a standard she also thought should be applied to men. She was generally silent on the subject during her time as First Lady, but on the last day of her husband's Presidency, as suffragettes rallied to try to convince incoming President Woodrow Wilson to support universal women's rights, Mrs Taft took a prominent spot in the grandstands to symbolically if belatedly lend her support to the cause. After leaving the White House, the Tafts lived in New Haven, Connecticut, where William taught Constitutional law at Yale University. With the best-selling Recollection of Full Years, she became the first former First Lady to have her memoirs published. She was reportedly delighted to return to Washington DC when her husband was appointed to the Supreme Court in 1921, and she continued living in the capital after his death. William and Nellie Taft's youngest son, Charles Taft, was co-founder of the World Council of Churches, a long-time Cincinnati city councilman, and served one term as that city's mayor. Their daughter Helen was a famous activist for women's rights, and a long-time professor of history and eventually Dean at Bryn Mawr. Their eldest son, Robert A. Taft, was a Republican Senator from Ohio, remembered today as the 'Taft' of Taft-Hartley Act fame, and considered to be the founder of the modern conservative movement. Their grandson, Robert Taft Jr., was also an Ohio Senator, and their great-grandson, Bob Taft, was Governor of Ohio from 1999-2007.